To make guava topping: Remove the flesh from each guava with a melon baller and place in a small bowl. In a small saucepan over medium heat, add sugar and guava flesh. Stir and combine, then add water. Cook, stirring rapidly until mixture thickens; for approximately 7 minutes. To make panna cottas: In a medium saucepan, heat half-and-half milk and sugar, whisking until it dissolves. Remove from heat and add in the vanilla extract. In a separate bowl, add gelatin and cold water. Stir until the gelatin dissolves. Spray eight ramekins with cooking spray. Add the dissolved gelatin to the half-and-half mixture. Stir and let it rest for 5 minutes. Divide the mixture equally, pouring into the prepared ramekins. Refrigerate for at least 4 hours. To unmold, run a sharp knife around the edge of the panna cottas and invert on a serving plate. Garnish with the guava topping. If you would like to omit the guava seeds, run the guava topping through a strainer before serving. Other than eating freshly picked guava, I love to enjoy this tropical treat in a colorful fruit salad, in a morning shake or in my warm oatmeal. 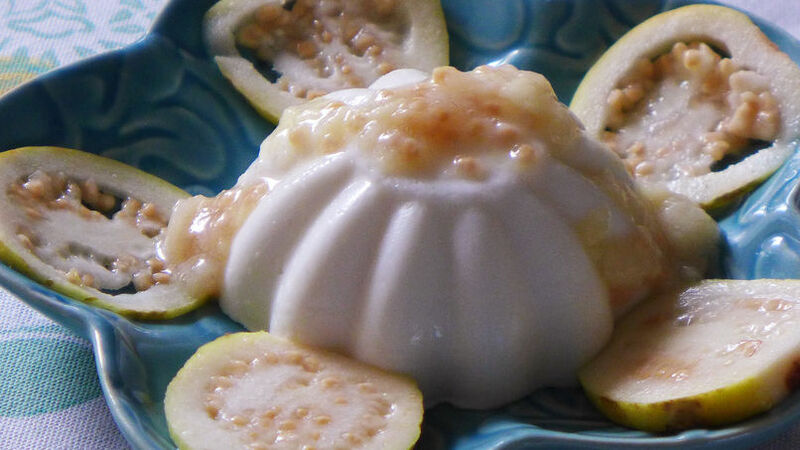 This time I decided to make one of my favorite and simplest desserts with guava: Panna cotta. Because of its creamy flavor, the sweet and tart guava topping is a great accompaniment. Since it is so rich, a small serving goes a long way. Serve it at you next dinner party following a heavy meal. Your guests will love every single sweet bite of this elegant dessert.